Its symbolic value cannot be understated. A new government will take over in June, the month the monsoon enters Indian territory. Though Indian economy is getting delinked from the monsoon, its impacts are still significant. As it is emerging, there is a high probability of the El Nino impacting the monsoon, which will result in erratic rains. This is going to be the first big challenge for the new government because the prominent electoral issues of food inflation and recovery of the economy are critically linked to the monsoon. It is safe to say that the new government’s test will start with a natural resource-related event. This is not to overemphasise the importance of natural resource management in judging a government. Rather, this is to highlight the fact that we often ignore the importance of environmental issues amid high-decibel political campaigns. In the end, most important issues from people’s perspective get buried in irrelevant political debates. Down To Earth has been tracking how environmental and developmental issues have been featuring in the national political discourse. It comes out clearly that there is a disconnect between the dominant campaigns of the political parties and what people want. But at the same time, after a bit of analysis of issues from both sides, it becomes clear they are dealing with the same issues. So the question arises: is the current election all about environment and development? Yes. The much maligned second stint of the United Progressive Alliance (UPA) is an example. If it is voted out of power, we can argue that poor management of natural resources squarely contributed to this. Even though the election campaigns took altogether different hues. Whether it is high food inflation, slow economic growth or a series of scandals, political parties ended up with oversimplified you-v-us political arguments. As a result, there has been no serious probing on the issues that would suggest bad natural resources management is the main culprit. What are the key controversies that marred UPA-II? Just to name a few: the 2G scam, coal allocation and gas pricing scandals. All of them are a result of non-transparent ways of managing natural resources. The scandals happened over who will receive the scarce resources and how. Now, look at the accusation of economic slowdown during the UPA’s 10-year stint. As the scandals broke out and favouritism over resource allocation came out, a panicked government was caught without alternatives. This happened because there has been no innovative thinking over natural resources management. Add to this the problem of large-scale land acquisition for various development projects. Protests picked up across the country over illogical land acquisition using dubious clauses of a more-than-a-century-old land acquisition law. The last five years saw debates over these issues like never before. There have been historic Supreme Court orders on natural resource allocation and management in the context of the above scandals. Such was the pressure on the government that for the first time a committee, headed by former bureaucrat Ashok Chawla, was set up to examine allocation of natural resources. The orders of the apex court and the Chawla committee recommendations fairly saw the problem as basic debate over the principle of sharing natural resources. But the political debates depicted them as scandals and shied away from any serious thinking over the challenge of natural resource management in the country. Interestingly, UPA-II also faced similar challenges in its other programmes. In 2009, when UPA was re-elected to power because of social safety programmes like the national rural employment guarantee law and the Forest Rights Act (FRA), there was a general political consensus over such programmes. An emboldened UPA-II continued with its rights-based governance by enacting laws like the right to food security. But in a short period, the government’s welfare programmes turned into simple doles that hindered economic growth. FRA became the single most important reason for lack of industrial investment. Again, the political class did not articulate this as an issue of natural resources management. The result: the business as usual growth versus environment debate became just a political tool with the former getting precedence. 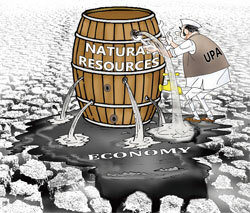 Notwithstanding the election results, the new government will face the challenge of natural resources management. The controversies UPA-II faced will continue to haunt the new government. This is an opportunity to get clarity on the challenge India is facing and will be facing more intensely: how to manage the natural resources.